Where Can I Spread Bet on the Wall St 30 / Germany 30 Differential? Where Can I Access Live Wall St 30 / Germany 30 Differential Prices? Where Can I Get Live Wall St 30 / Germany 30 Differential Charts? Where Can I Practice Trading the Wall St 30 / Germany 30 Differential? FinancialSpreads.com offers a wide array of markets such as the Wall St 30 / Germany 30 differential in addition to individual stock market indices like the Hong Kong 50, UK 100 and France 40. 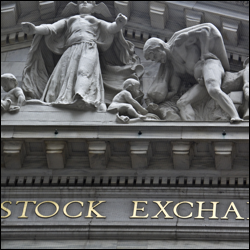 Using a Financial Spreads account you can take a view on over 1,000 real time prices including markets like the Wall St 30 / Germany 30 differential and a wide range of other stock markets, forex, shares and commodities markets. When trading with a Financial Spreads account you can look at up-to-the-minute candlestick charts for the Wall St 30 / Germany 30 differential and over a thousand other markets. A wide range of time periods such as 5 minutes, 15 minutes, 1 day etc. 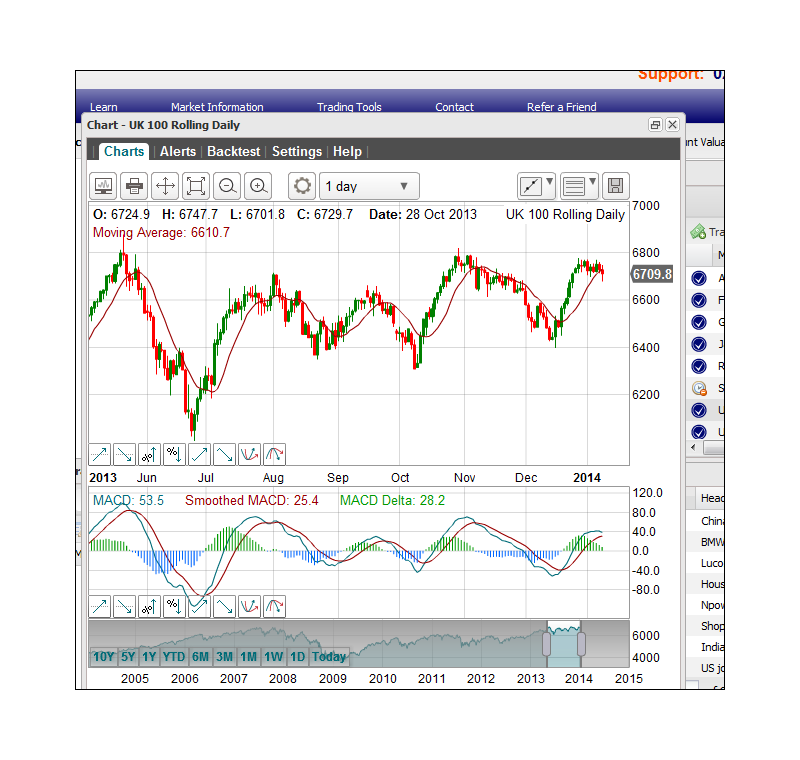 Indicators and chart overlays such as Moving Average, RSI, Williams %R etc. On the expiry date for the March market, 19 March 2015. This market is a 'Futures' market and therefore your trade will automatically close on the settlement date. However, you can usually close your trade, during market hours, before the end of the contract. Note, you don't pay any overnight financing fees on this futures contract. Traded Units: Spread betting trades on the Wall St 30 / Germany 30 differential futures market are made in £x per point. E.g. if the Wall St 30 / Germany 30 differential moves 30 points then you would lose or gain 30 multiples of your stake. Trade Size: You work out your stake per point, e.g. £1 per point, £4 per point, £20 per point etc. Quick Example: If you went with a stake of £3 per point and the Wall St 30 / Germany 30 differential moves by 25 points, you would win/lose £3 per point x 25 points = £75. When the futures contract ends, 19 March 2015. Close for a Profit? At this point, you could decide to leave your position open, and maybe let it run to the settlement date, or close it to take your profit. In this instance you decide to close your trade by selling the market at 6100.4. The Wall St 30 / Germany 30 differential falls. Close and Limit Your Loss? You can opt to keep your position open, and maybe let it run to the expiry date, or close it, i.e. close your trade to restrict your loss. In this example you choose to run your position until expiry. Ultimately, the futures market settles at 5961.8. On the settlement date, 19 March 2015. Take Your Profit? You can decide to leave your trade open, and possibly let it run to the settlement date, or close it, i.e. close your spread bet to lock in your profit. In this case you choose to let the trade run until expiry. Ultimately, the market closes at 5966.5. Close and Restrict the Loss? You may choose to keep your trade open, letting it run to the settlement date, or close it, i.e. close your position and restrict your losses. In this example you decide to close your trade by buying at 6077.3. Where Can I Practice Financial Spread Betting on the Wall St 30 / Germany 30 Differential? FinancialSpreads provides traders with the ability to put one's trading skills to the test by using a Demo Account, test markets include the Wall St 30 / Germany 30 differential. The Demo Account offers a wide range of markets including commodities, FX rates, stock market indices and stocks.